Part 3 of Christmas Gifts from Stirring Stuff: Easy cheesy biscuits. With Christmas festivities starting in earnest, what better way to thank your host than with a tin of delicious homemade cheesy biscuits. If you are entertaining at home or are prone to ad hoc parties then the Stirring Stuff selection offered here is a great standby. All three biscuits are simple to make and will keep in tins for a couple of weeks. 1 additional egg for glazing and the final teaspoon of toasted fennel seeds. 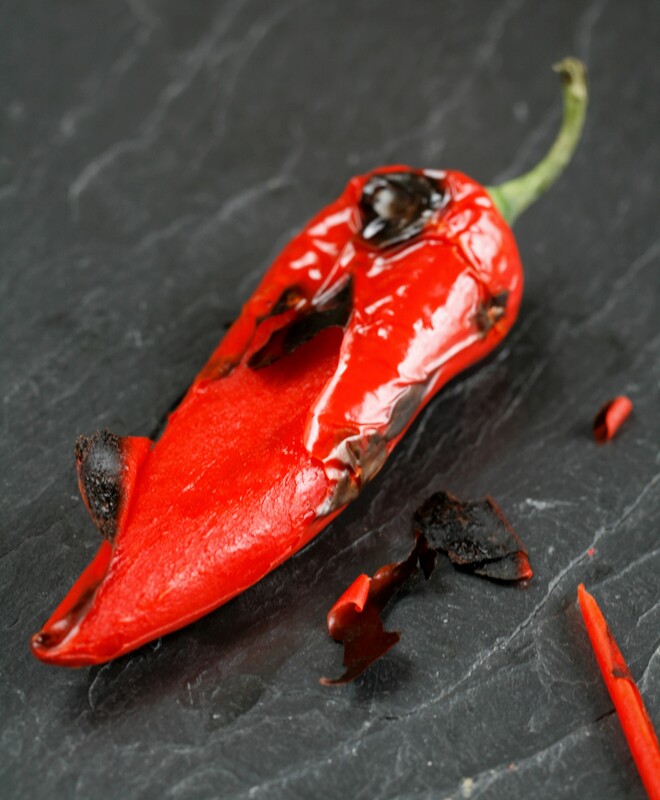 Prepare the chilli by putting it into a frying pan over a high heat, turning regularly until all sides are blistered and black. Remove the chilli from the pan and allow it to cool. Remove the skin and the seeds and dice the flesh very finely. Measure the ½ a teaspoon required for this recipe. The rest can be covered and put into the fridge for use within a few days or pop it into an ice cube container and freeze. Toast the fennel seeds in a frying pan over a moderate heat until they are aromatic and beginning to brown. Tip the seeds into a pestle and grind coarsely. Put the flour and the baking powder into a large mixing bowl. Add the diced butter, mix to coat with the flour and then rub into the flour to the breadcrumb consistency. Add the ½ teaspoon of the diced chilli, 1 teaspoon of the toasted crushed fennel seeds, and the sweet smoked paprika. Mix gently to combine the flavours. Add the two egg yolks and mix everything together to form a dough. On a lightly floured surface gently knead the dough and then form it into an oblong, cover with cling film and rest the dough in the fridge for twenty minutes. Lightly flour a work surface and roll the dough as neatly as you can into to a length of just over 36cm x 9cm. trim the pastry to the exact size so that your straws are even. Mark the narrow edge at 1.5 cm distances (you should have 6 lengths) and cut carefully. Cut each strip into 4 x 9cm lengths. Beat the additional egg with a pinch of salt. Lightly brush the top of each straw with a glaze of egg wash. Sprinkle over the remaining fennel seeds. 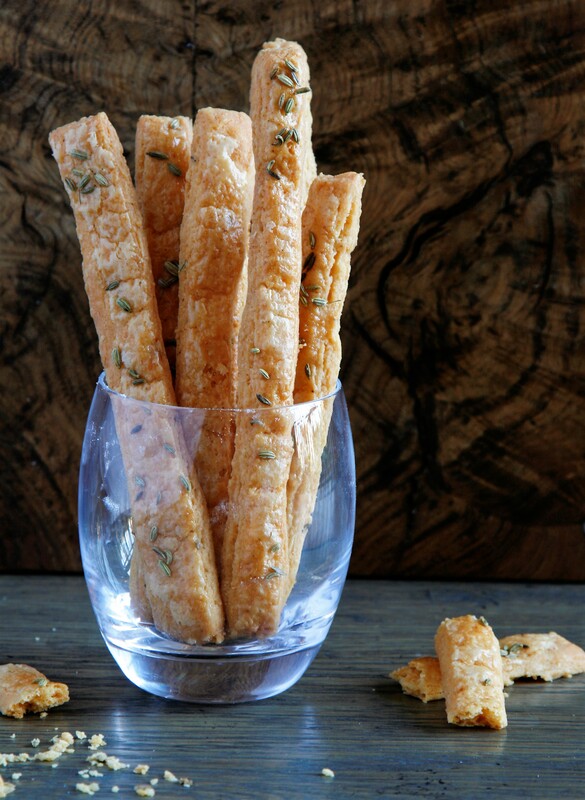 Put the straws onto a base lined flat baking sheet and cook in the hot oven for 12-15 minutes until they are golden. Remove from the oven and leave until the straws are cool enough to handle and then remove them to a cooling wire. They will store in an airtight container for several weeks. Put the Roquefort and butter into a large mixing bowl and blend well together to a soft paste. You can use an electric hand held whisk to do this. Add the egg yolks and blend to mix. Tip in the flour, cayenne and the finely chopped walnuts and stir well to form a soft dough. Scrape the dough onto a lightly floured work surface and with floured hands gently knead it into a smooth ball. Flatted the dough to a disc shape, wrap in cling film and chill for a couple of hours. Line one large or two smaller flat baking trays with parchment. Bring the dough back to room temperature before rolling out on a well-floured surface to 1/8-inch thick. Cut into 1-1 1/4-inch coins. I use the large end of a metal piping nozzle. Carefully push each disc onto the prepared baking tray in neat rows. Press a walnut half lightly but securely on to half of the discs. Cover the cut biscuits and refrigerate for 20 minutes before glazing and cooking. 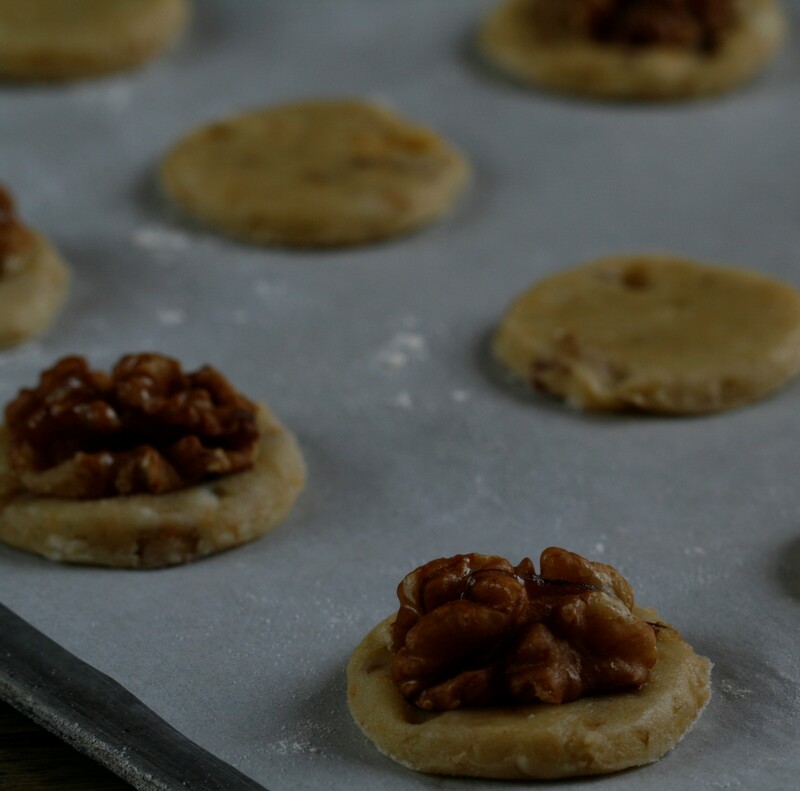 Beat the whole egg with a pinch of salt and lightly glaze each of the shortbreads including the nuts, trying to avoid run-off on to the baking sheet or the biscuits will stick. Bake for 12-15 minutes at 170°C until nicely golden. Allow to cool slightly before removing to a cooling wire. To make the filling put both ingredients into a small bowl and mash together with a fork until smooth. To fill the biscuits, spoon a teaspoon of the mix on to the base biscuits and sandwich with a walnut topped biscuit. You can fill the biscuits several hours in advance of serving, in fact it slightly softens the biscuit making them easier to eat. 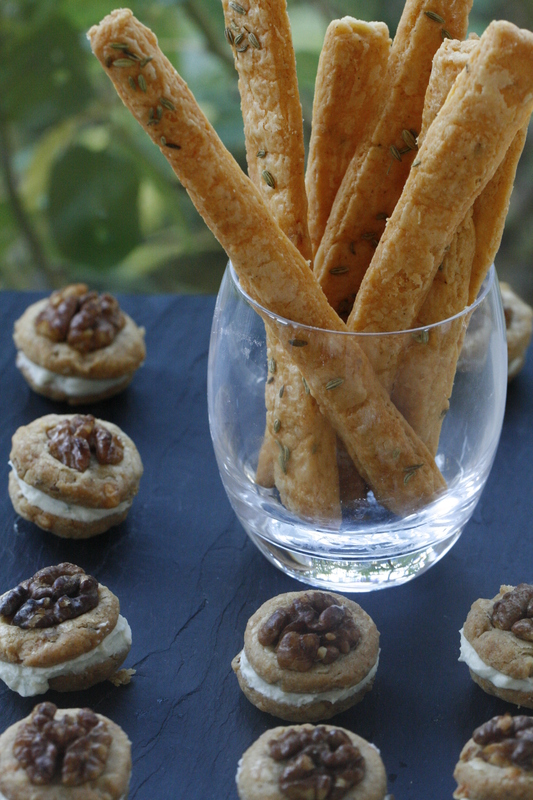 These biscuits could also be made with Stilton or Blue Wensleydale. 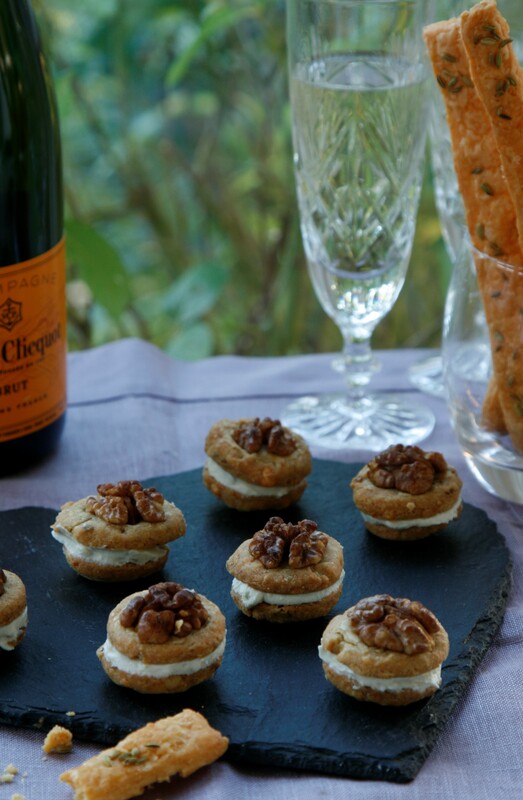 Party time – Roquefort sandwich biscuits and cheese straws with champagne. Makes 20 depending on size. Heat the oven to gas 6/200c and line a flat baking tray with parchment. Using a small pastry cutter as a template, sprinkle the grated cheese thinly into rounds, on to the prepared baking tray. sprinkle a third of the biscuits with a tiny bit of sweet smoked paprika and a third with nigella seeds and leave the final third plain. Bake for 3-5 minutes until lightly golden. Cool until the biscuits until they are set and then remove to a cooling wire. Store in an air tight tin.